Above: End of the trail sign in Santa Monica, California. That's it, we made it! After nearly 2,450 miles on the most legendary road of the continent, after the skyscrapers of Chicago, Illinois, the prairies of the Ozarks, Missouri, the Indian Territory of Oklahoma, Texas cowboys, old stones of New Mexico and the arid landscapes of Arizona, we are about to cross the mythical California border. As the first pioneers of the Gold Rush in the late nineteenth century in their quest for the West, wide open spaces and mines filled with valuable treasures await us. As the Oakies of the Great Depression that followed them, and whose exile is narrated by John Steinbeck in "The Grapes of Wrath", and as everyone else who saw California as the promised land. Above: Historic Route 66 in California. The extreme Mojave Desert welcomes us on the state border, as we hit the small town of Needles, the hottest town in the US, with temperatures blithely exceeding 105°F (40°C) in summer. Thereafter, peaks, mountain passes and steep, at times dangerous road segments. This should not come as a surprise because California, beyond deserts and oceans, is primarily a State of mountains. The same that were sculpted by the constant tectonic movements causing daily, usually imperceptible earthquakes. On many occasions, Route 66 runs along the fearsome and feared "San Andreas Fault", the source of many geological movements. Above: Gas station in Goffs, California. As we overcome various peaks, the Cadiz Summit and then Cajon Pass (3,777 ft.) lead us from Barstow to San Bernardino. At high altitude, nights can be especially cool as the Route progressively descends. From afar, we can already anticipate the smog over L.A. and further west, the vastness of the Pacific Ocean. San Bernardino serves as a gateway to the metropolis of Los Angeles, a dizzying tangle of highways. Keep your map (or GPS) close at hand because you will need to follow the Interstates most of the time -as everyone else - and they are usually backed up. Permanently jammed to be honest. 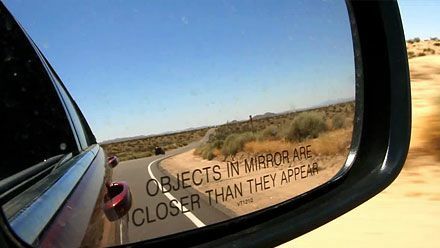 Beware of cars slaloming to pull ahead and sneak into the carpool lane in the commute period if two or more passengers are riding in your car (see our section "Driving in the United States"). 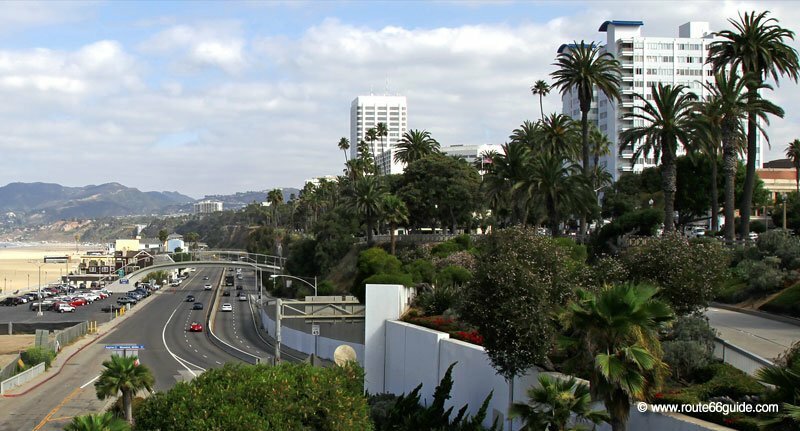 Above: California State Route 1 in Santa Monica, designated as "Pacific Coast Highway" in Southern California. In short, reaching the Pacific Ocean shores can become a lengthy and arduous exercise. For now, however, forget that stressful moment. 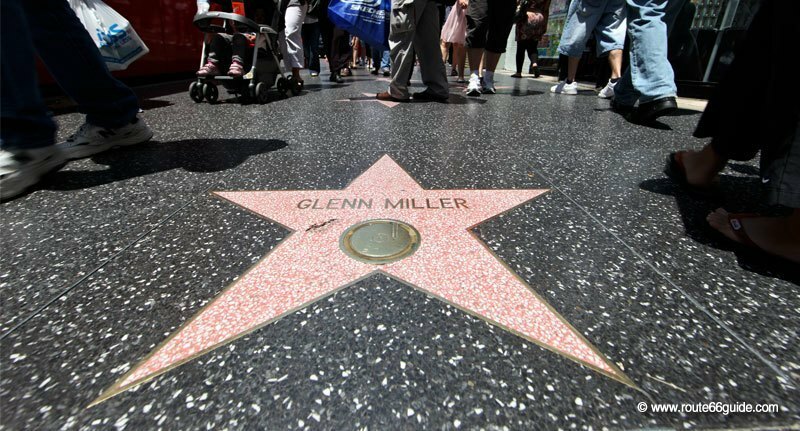 In fact, as soon as you leave the main, regularly jammed roads and enter downtown LA, you start touching the myth with your fingertips -literally- as you stroll up and down Hollywood Boulevard, with the fingerprints and stars of the personalities that line its sidewalks. 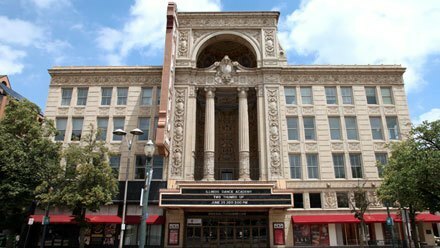 The street contains several mythical theaters and the historical headquarters of the largest film production companies in the world. 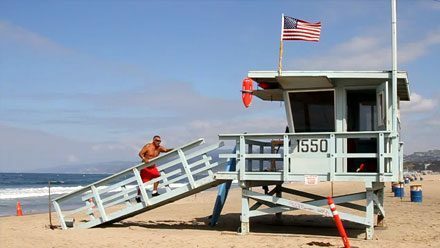 Above: Santa Monica Beach (Los Angeles), California. Santa Monica Pier symbolically marks the end of the road. Facing the vastness of the Pacific Ocean, we leave behind nearly 2,450 miles of memories, emotions, history, stories, and encounters. 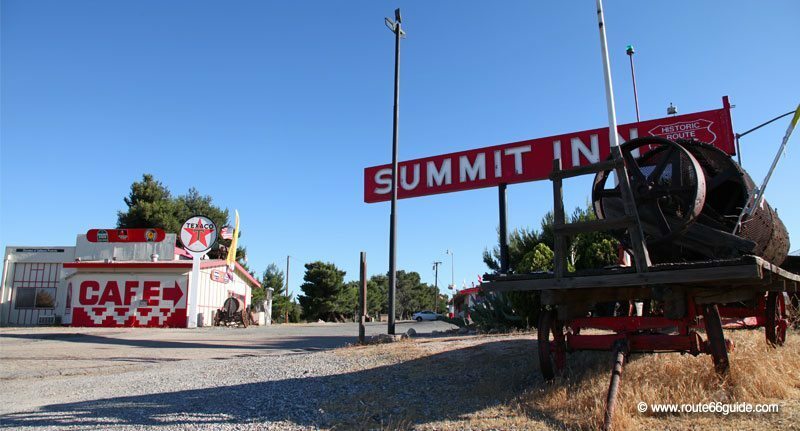 Needles, the hottest city in the United States, opens the doors to the extreme Mojave Desert. 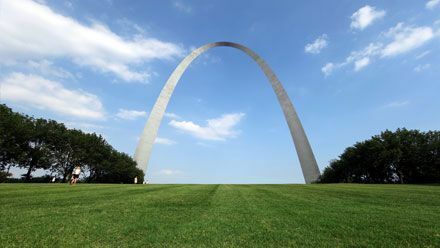 It owes its name to the needle-like mountains surrounding it. 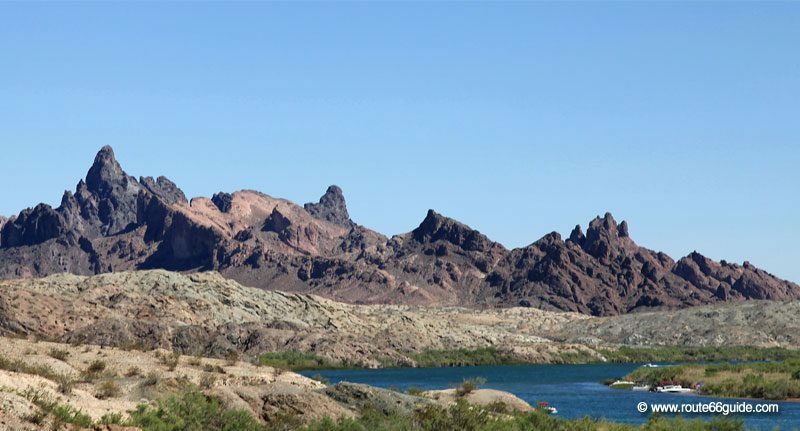 Above: The Needle Mountains serve as a gateway to the Mojave Desert, the last oasis of greenery for several hundred miles; Route 66 rushes into one of the most extreme landscapes on its path. 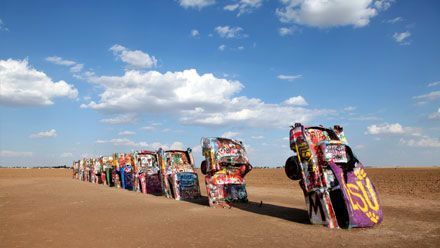 The Graffiti corridor around Chambless continues a strong, decades-long tradition of Route 66, a form of participatory art that invites everyone to own - or initiate - the work (the Cadillac Ranch tagged by visitors in Amarillo, Texas is the tradition bearer). 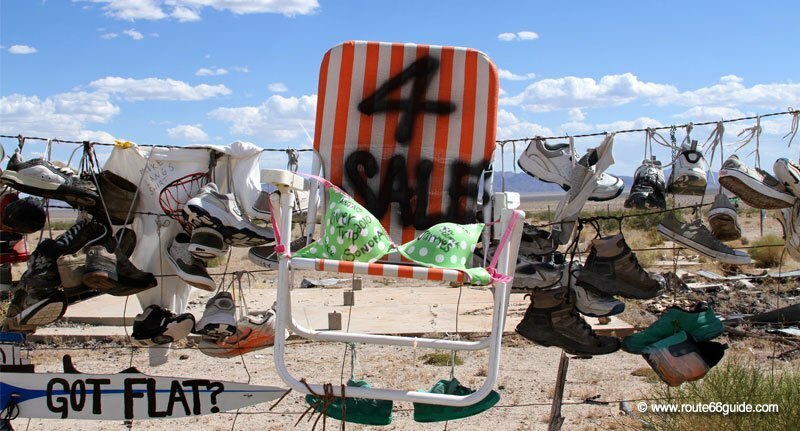 Here, visitors hang their shoes or tag their names and other slogans on a corridor of several miles between Essex and Amboy, west of Chambless. Watch out for snakes in the grassy area if you would like to contribute with your stone to the overall structure. Above: Shoe fence in California. The Amboy Crater is a volcanic crater located in the vicinity of Amboy, a ghost town since the late 1940s, which once had its airport, church, school, cemetery, coffee shop, garage, etc. The crater was formed 6,000 years ago. It can be reached on foot after an approx. 2-hour walk. Above: Roy's Motel and Cafe in Amboy, California. Bagdad Cafe in Newberry Springs is located in the Mojave Desert, faithful to the eponymous film which sees the confrontation of a lost German tourist and the bitter owner of this little cafe-motel-gas station. 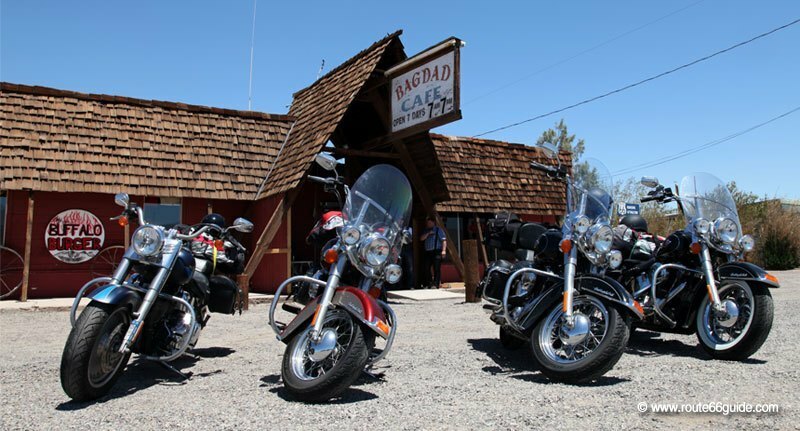 Above: Bagdad Cafe in Newberry Springs, California. The ghost town of Calico, about 3 miles off Route 66, includes the abandoned buildings of an old mining town founded in 1881 in the Calico Mountains, in the heart of the Mojave Desert. Its subsoil filled with silver ore drew up to 1,200 people and over 500 silver mines and bars, arcades, brothels ... and some churches needed for the community to thrive. Calico was completely abandoned in 1907 as the mines were depleted of their precious metal. 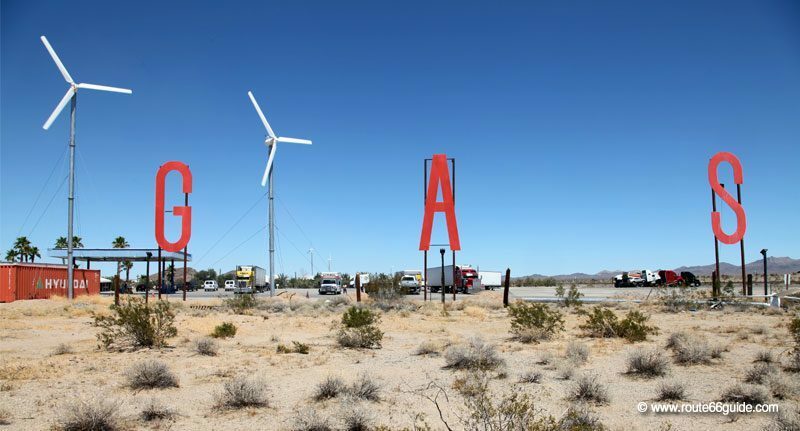 The ghost town, now a protected historical monument, is located slightly off Route 66, a little less than 3 miles from Barstow (you can surely spot the giant "Calico" letters on the mountain from the Interstate). Above: Route 66 Museum in Barstow, California. 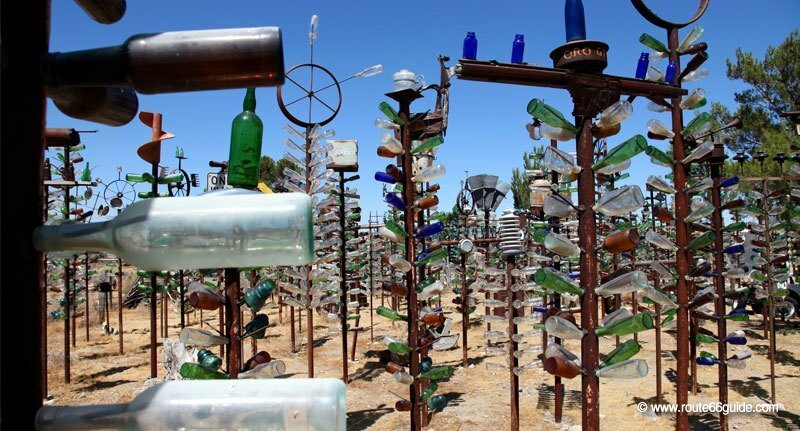 The Bottle Tree Ranch east of Helendale is the private initiative is an artist whose father recovered the bottles abandoned near Route 66. He produced this amazing artistic composition, stitched up with hundreds of empty bottles and old signs. Attention: closed to the public - only observation from the road is allowed. Above: The Bottle Tree Ranch, between Barstow and Victorville in California. The Cajon Pass is the last highest peak on Route 66, which then starts its long descent towards the megalopolis of Los Angeles. At 1,280 meters, the little "Old Outpost Cafe, The Summit Inn", outside the beautiful building from another time, piles up old cars, tractors and vehicles, some of them even perched on the roof! Above: The "Old Post Cafe" at the top of Cajon Pass sits at 4,190 ft. The original pavement of Route 66 in Devore is probably the only example of its kind still visible along the historic route. San Bernardino serves as a gateway to the sprawling agglomeration an inextricable entanglement of highways of Los Angeles. 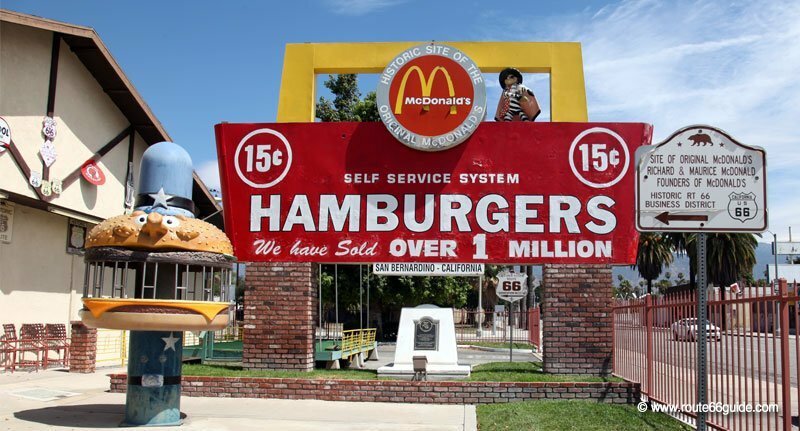 The small town of San Bernardino - without major attractions - yet saw ... the first McDonald's in history! It opened in 1948 but soon left its spot to ... a competing fast food brand! Above: The World's First McDonalds Restaurant. San Bernardino, California. 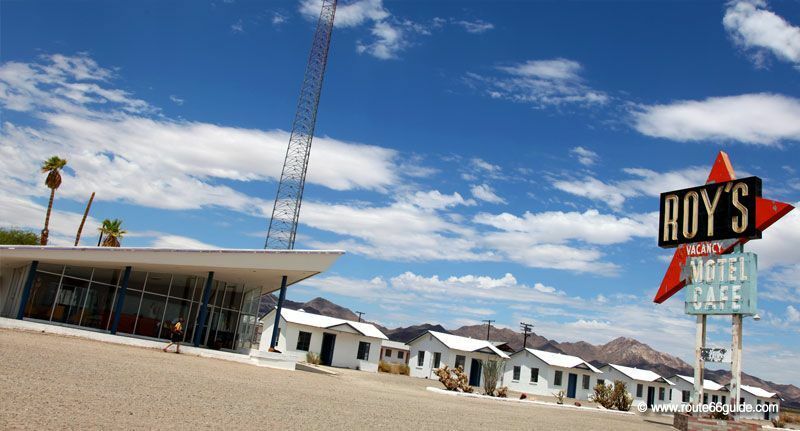 The WigWam Motel in Rialto is the second of its kind that you will find along Route 66, after the one in Holbrook, Arizona. Formerly part of a chain of seven similar establishments standing near Route 66 from the 1930s to 1950s, "WigWam" motels uniquely host their guests inside hard-fabric teepees. 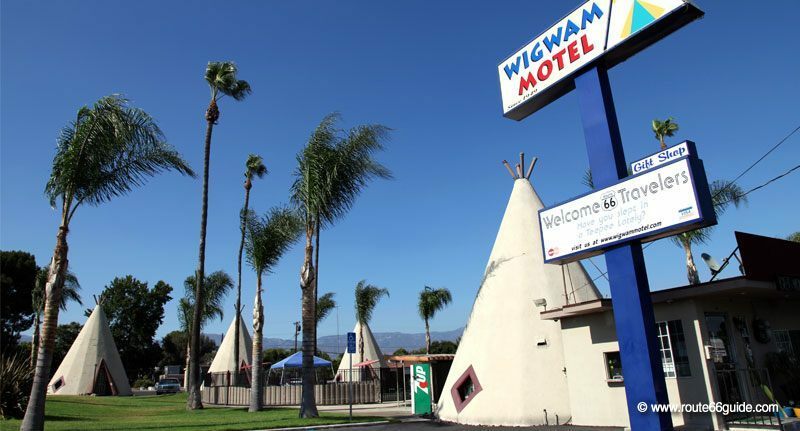 Above: The WigWam Motel plants its iconic teepees along Route 66 in Rialto. El Centro Market, in Pasadena, invented the concept of the "Drive-Thru Market". 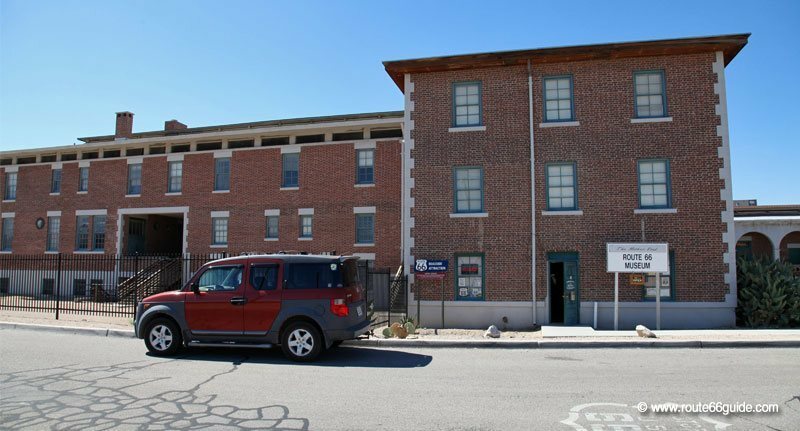 Recently renovated, it welcomes motorists as it always did. Hollywood Boulevard takes us to the heart of downtown Los Angeles, honoring with its famous starts the names of major celebrities in cinema, music, television, theater and entertainment, while the most illustrious among them left their handprints and footprints in front of Grauman's Chinese Theatre. Above: The famous stars engraved with the names of no less famous artists of film, theater or television adorning the sidewalks of Hollywood Boulevard. Rodeo Drive avenue in the chic and legendary Beverly Hills neighborhood in Los Angeles, is the essential shopping-spot for the jet set in LA. Marquee brands crowd the sidewalks only to leave their place to the impressive residences hidden behind dense hedges. 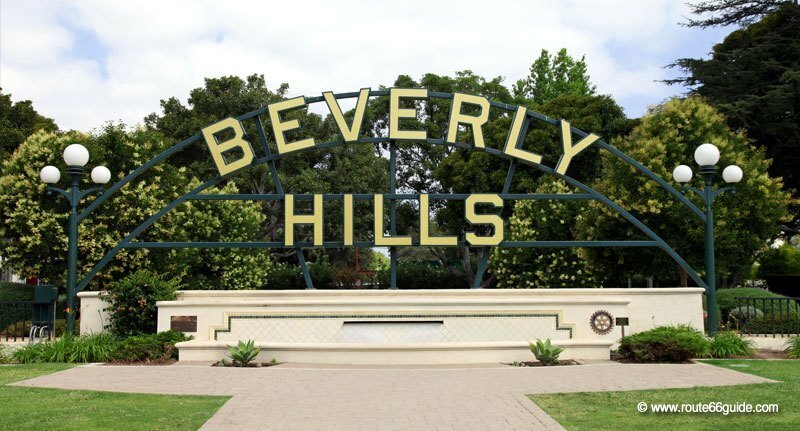 Above: Iconic Beverly Hills Sign in Beverly Gardens Park. 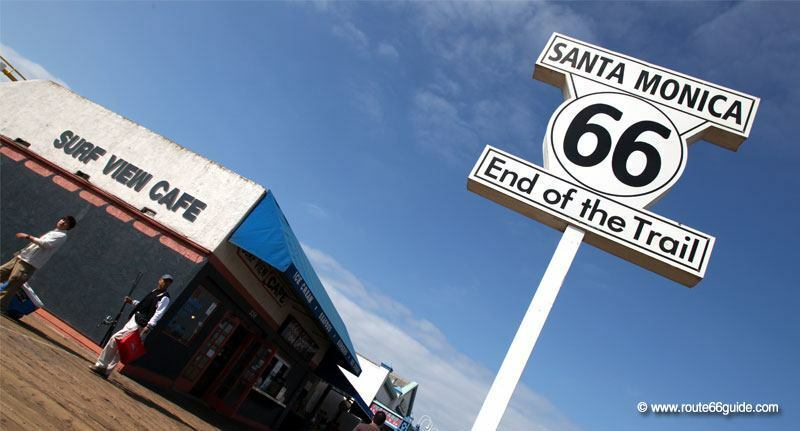 Santa Monica Pier symbolically marks the end of Route 66. A sign, on the bridge that extends out into the Pacific Ocean, indicates the precise point. California is the last state crossed by Route 66 (or the first if one chooses to go from west to east). 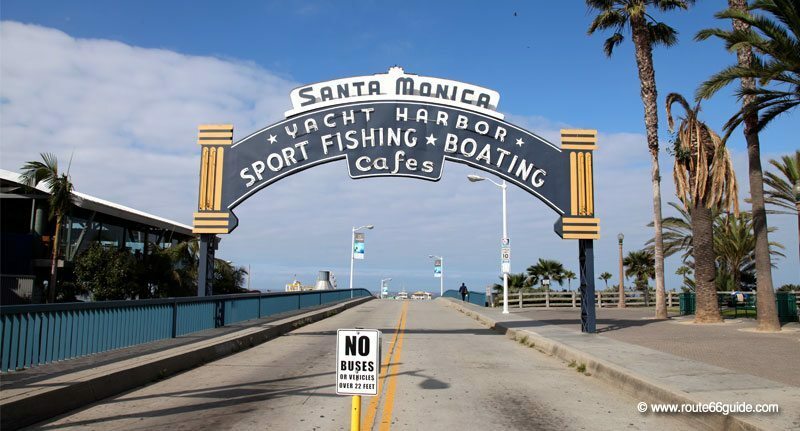 The historic route symbolically and poetically ends on the Santa Monica Pier, facing the Pacific Ocean. 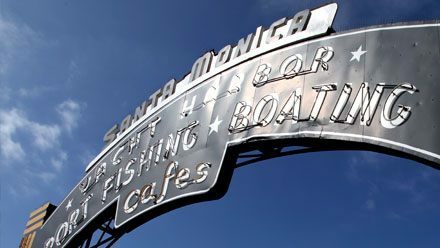 Above: Santa Monica Pier symbolically marks the end of Route 66. Los Angeles is the city of angels, stars and caps! 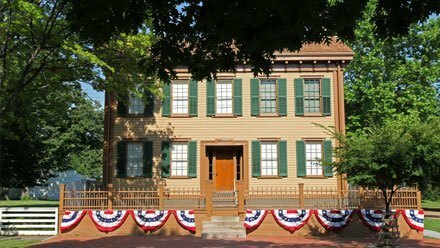 Practice patience to go through the most important urban area of the U.S. 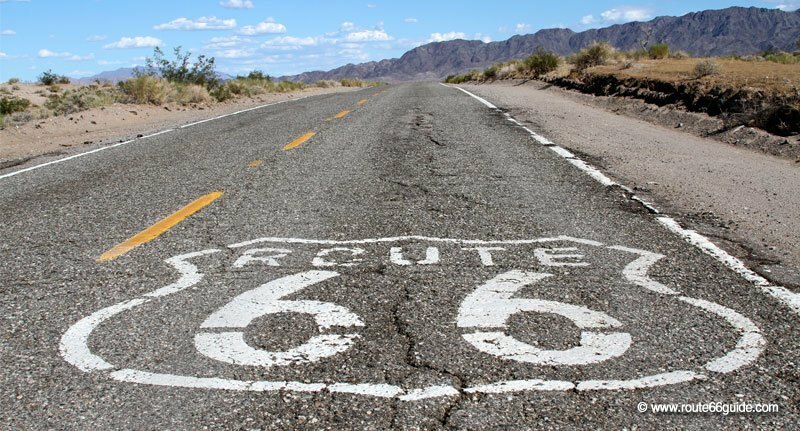 In California, Route 66 only travels a small portion of this vast state, over a little more than 314 miles from east to west, from Needles to Santa Monica, in the southernmost part of California. Above: Santa Monica Beach, California. 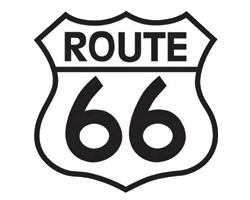 Unfortunately, Route 66's profile has been repeatedly changed and no segments were kept. 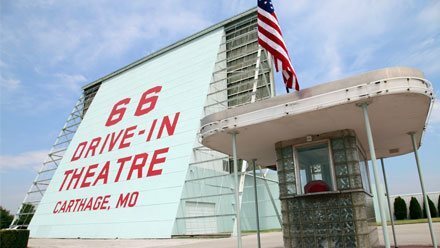 Thus, part of your Route 66 road trip in California will go on various Interstates. That's too bad! 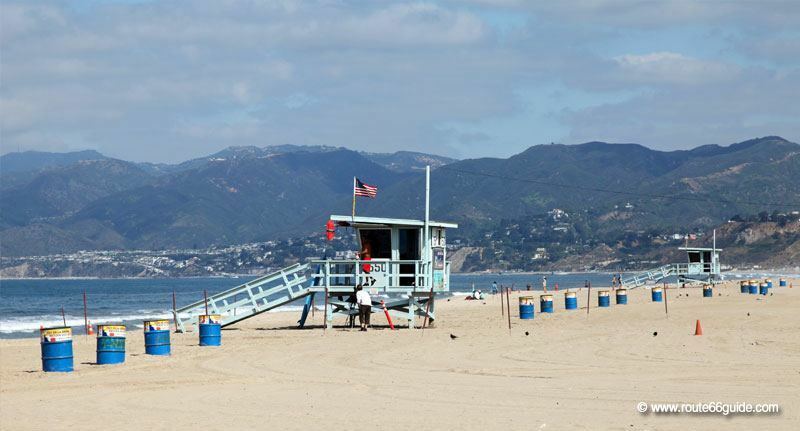 As you explore this particular area, keep in mind that Southern California and its different faces - desert, mountain, beach, spas, and a superficial glamour at times - by no means reveal the entire state. In this respect, we can only advise you to head to the cooler, wetter and greener north. Northern California gravitates around San Francisco, the most European of the small American megacities, bordered by the mythical Silicon Valley, a business complex home to the biggest names in computing and technology. Above: Route 66 near Barstow, California. Further north, vegetation reclaims its rights as we come to the vineyards of Napa and Sonoma valley. These areas are known for their excellent wine production, some developed by French winemaker expatriates, which can confidently go head-to-head against some of the best European counterparts.